I had to take this picture with my iPhone during dinner because I couldn’t keep these chips away from my family long enough to get a decent shot. They’re that good. My mom, who is trying to stick to mostly meats, fruits, and veggies couldn’t resist them. She can’t resist any potatoes for that matter. We call her the potato hoe. Is that dysfunctional? Don’t answer that. Also, I don’t think anything is better than garlic aioli. Seriously, it’s good on fries, burgers, sandwiches. So much stuff. If it wasn’t frowned upon, I would eat it by itself. Okay maybe not. But still, I really like it. To change it up, I added some parmesan and also made it low fat so that I could indulge without consuming mega calories. As for the potatoes, I just got tired of roasted potatoes covered with garlic. So I decided on chips. 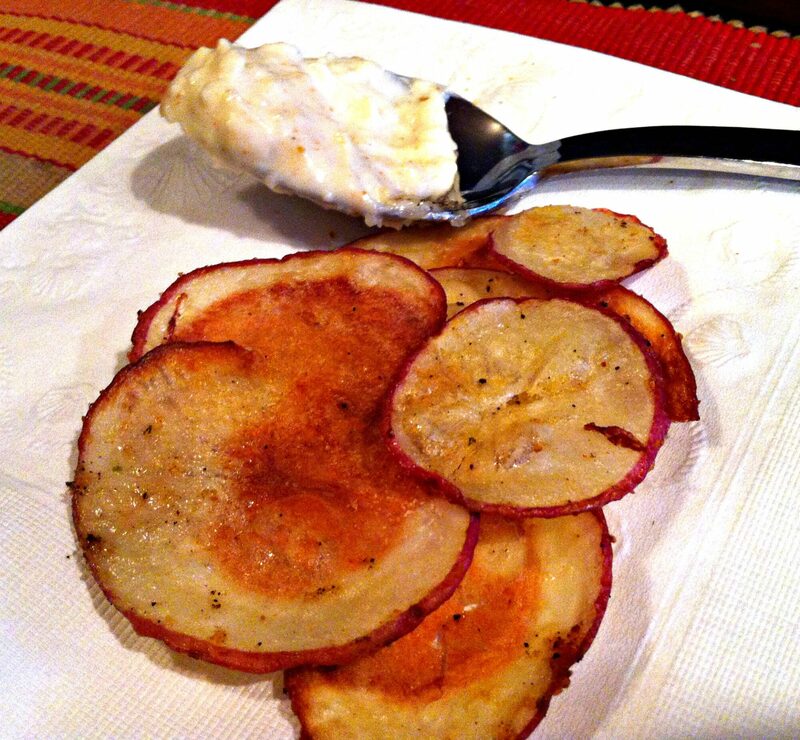 Slice potatoes with a mandolin or on your food processor attachment. Soak potatoes in ice cold water for 15-20 minutes. 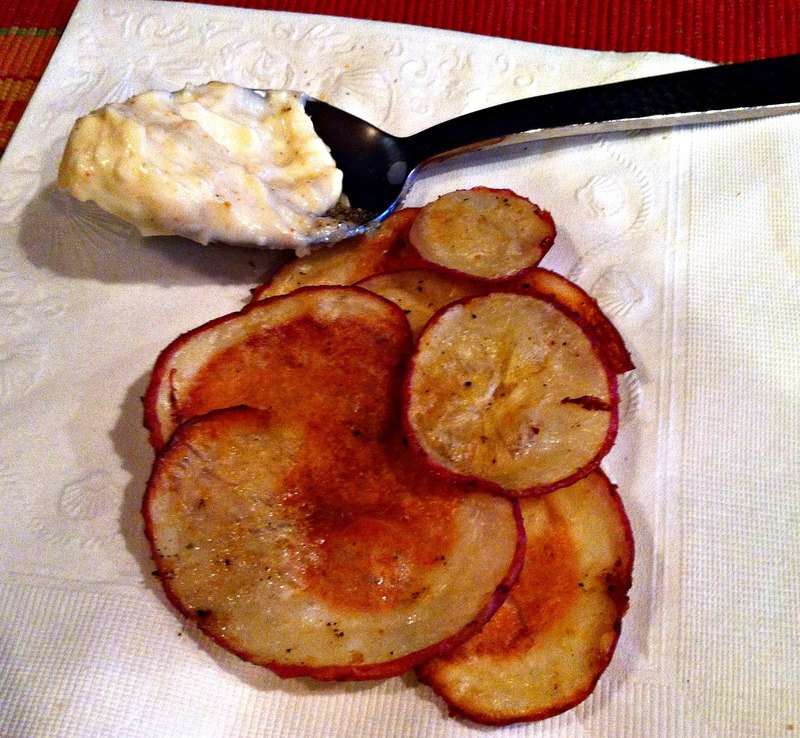 Drain the potatoes, dry them, and place them on a greased baking sheet. Drizzle with olive oil, salt, pepper, garlic powder, onion powder, and paprika. Mix with your hands to make sure the potatoes are completely covered in oil and seasoning. Lay them in a single layer on your baking sheet. Bake them for 15-20 minutes, or until crispy. Combine the low fat mayo, lemon juice, ceyenne, parm, and garlic. While whisking, add the olive oil. You may add some milk or some more oil to get the right consistency. Add salt and pepper to taste. Serve with the baked chips. Vegetarian: Use Greek Yogurt instead of mayo. Vegan: Add Veganaise or homemade vegan mayo. Paleo: Use zucchini instead of potatoes and Greek Yogurt instead of mayo.